The war against corruption may have become mere comical rhetoric under the Buhari administration. This is a litany of economic and financial crimes occurring within the presidency go unexplained and un-investigated. Available information points to the chief of staff to the President, Abba Kyari as the engine room of the corrupt activities emanating from the presidency. This was confirmed to 247ureports.com by Ex General Adamu Yusuf who detailed how huge sums of looted funds denominated in United States Dollars and gold bars estimated to be worth N2 billion were recovered through an informant – which suddenly disappeared without a trace in neither the Central Bank of Nigeria nor Ministry of Finance. 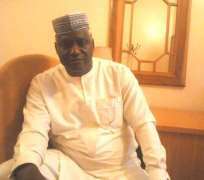 In an exclusive interview with Brigadier General Adamu Yusuf (rtd), he revealed how the money was recovered by the President’s men and then looted by Aba Kyari and company. Yusuf explained that he played active role that lead to the recovery of the funds. The funds are believed to be proceeds from the Malabu Oil Block deal. He said the funds have been shared by some highly placed persons within the presidency. “I got very reliable information from a friend, Hon. Chuma Nzeribe that money was stashed in Flat 6, Block 1 (NNPC Quarters, Area 11, Garki, allegedly owned by former Attorney-General and Minister of Justice, Mr Bello Adoke.) Subsequently, my contact in the Villa immediately introduced me to Abba Kyari. “One of them had to flee from the country, she went on self-exile, because her life was being threatened, she was kidnapped and subjected to all manner of dehumanizing acts. The most painful and shocking part of this is that after the successful operation of evacuating the stashed funds, nothing was reported as recovered because it was not reflected anywhere,” he stated.